In walks the Chicago Bears. Chicago started off the season with three straight wins, two of them coming against what many thought at the time were Super Bowl contending teams: Dallas and Green Bay. No longer. Since then, Chicago has lost three of their last four, with their quarterback, Jay Cutler, back to his old form, throwing interceptions like a chubby prom queen (who got elected because she “has a good personality”) tossing tootsie rolls from the backseat of your grandpa’s ’57 Chevy convertible at your sister’s homecoming parade. In case you can’t tell, I’m pretty sure that Chicago is a fraud. I’m not saying Buffalo is going to make it to the play-offs, or even win more than 3 games this year, I’m just saying, Chicago is going into a minefield in Buffalo where the team is charged after two straight overtime losses, and the fans are pissed because its starting to really get cold again. Buffalo will beat the Bears, and probably seal it in the 4th quarter. The Indianapolis Colts lost the Super Bowl last year. This year, they haven’t had much of a drop off, only losing two games so far. 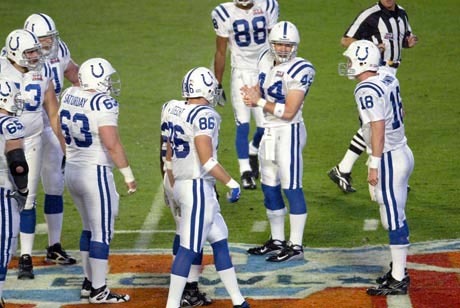 Peyton Manning, the Colts’ quarterback, is probably the best quarterback in the NFL. Coaches say it’s like having a coach on the field all the time. Not only does he grasp the offense as well as the coaches, he has unbelievable talent. Few players have ever matched his ability. The Philadelphia Eagles get their starting quarterback, Michael Vick, back this Sunday. Vick has been out with an injury while their original starter, Kevin Kolb has had the reins of the team. Really, both quarterbacks could start on many teams in the NFL, but Philadelphia has the good fortune of having two excellent quarterbacks. Vick brings another element to the offense as his ability to run has filled many-a-ESPN highlight reel. In this particular match up, its Indianapolis’ chance to show they’re for real. Both of Indianapolis’ losses have come away from home and if they are to make it back to the Super Bowl, they need to win these type of games. I think the Colts are for real and will beat the Eagles. Hopefully along the way, Vick will break some sick run for a TD, so we’ll have something to watch Monday on the highlight reel. One Liner: “Where is Rex Grossman when you need him?” Referring to former Chicago Bears quarterback Rex Grossman that was mostly abysmal, but not looking that bad now that Cutler has continued to be an interception throwing machine.